Citation | Aung M, Thein SM, Phaw NC, Phyo TH, Phyo YP, Phyo NY, Bik LV, Bo Bo A, Maw H, Maw AM, Maw SY, Moe PPP, Lwin DS, Myint KS, Kyawt YY, Mu KS (2019). In vitro fermentation of grass based diet supplemented with two different tree legume forages in ruminant. Adv. Anim. Vet. Sci. 7(4): 272-279. Copyright © 2019 Aung et al. This is an open access article distributed under the Creative Commons Attribution License, which permits unrestricted use, distribution, and reproduction in any medium, provided the original work is properly cited. The feeds for ruminants could be categorized as roughage and concentrate, in which roughages are used as fibre source and concentrates are used as energy and protein source. In Myanmar, agriculture byproducts and crop residues are used as fibre sources, which are low in protein, energy, minerals and vitamins. Thus, the concentrates have been supplemented to roughage diets to obtain the highest performances of animals. Groundnut cake, sesame cake, cotton seed cake, broken rice, rice bran and chickpea mill are used as concentrate sources for ruminants in Myanmar (Min Aung et al., 2016; MyoKhaing et al., 2016). Supplementation of concentrates to roughage based diet enhances the animal performances, however the feed cost are high because of expensiveness of concentrates. With the targets of reducing the feed cost and sustaining good performances of animals, the researchers tried to replace the high quality exotic grass into low quality local forages. 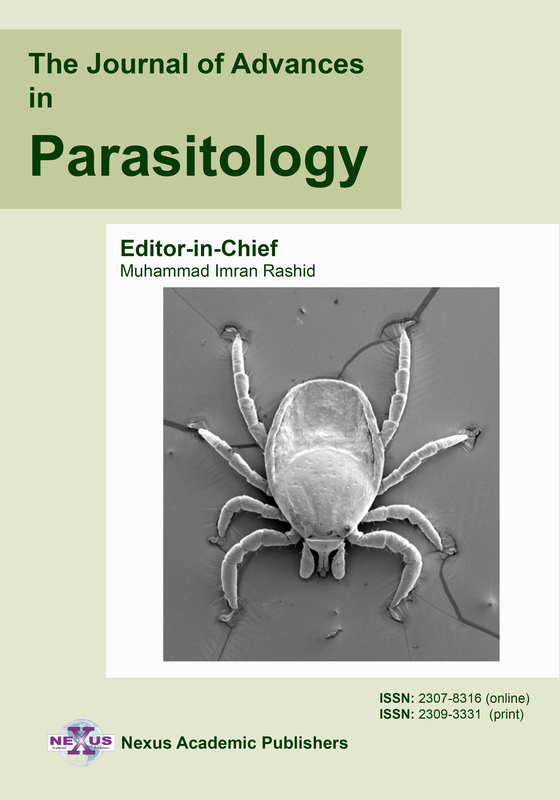 Among the exotic forage, Basilisk, Mulato II, Cayman, Toledo and Ruzi gave the highest forage yield and nutritive values (Nang Kham Hline et al., 2015).Thin Yadanar Soe (2017) showed that the nutritive values, in vitro fermentation and in situ degradation parameters of Mulato II were higher than those of Mombasa, Cayman, Napier and sorghum at 60 days harvest. The higher nutritive values, nutrient degradability and daily weight gain were observed in Mombasa based diet in comparison with Sorghum based diet (Soe Min Thein et al., 2017). Although the animal performances were increased with the use of high quality exotic grass, the high cost for feed was still remaining because of concentrate supplementation. Therefore, it is considered to use cheap and high nutritional quality feed, legume forage, as a replacement for expensive concentrates. Legume forages were a cheap source of nitrogen to livestock when used as a supplement to low quality forages (Devendra, 1992) and improve feed intake and animal performances (Abdulrazak et al., 1996). Norton (1994) also reported that the potential roles of tree forages in ruminant nutrition are palatable, high quality protein content, high digestibility, as source of by-pass protein, vitamin, and minerals, and can be utilized for the partial replacement of commercial concentrates to give less cost of feeding. 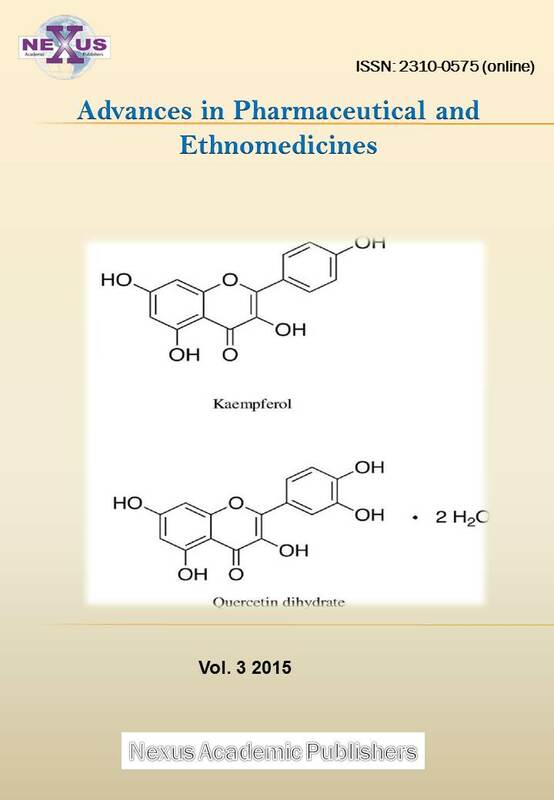 Moreover, gliricidia and leucaena leaves could be used as nitrogen sources without causing detrimental effects in ruminants (Lwin Naing Oo, 2002; MyoKhaing et al., 2016). However, the supplementation of high quality legume forage to exotic grass on feed cost and animal performances are still remaining to investigate. The feeding trial is required to determine those parameters; however the feedstuffs and diets should be analyzed with in vitro trial prior to feeding trial to avoid undesirable feeding problems. The in vitro gas production method has been successfully applied at the aspects of feed evaluation, including organic matter digestibility (OMD), metabolizable energy (ME) (Menke and Steingass, 1988), short chain fatty acid (SCFA) (Makkar, 2005) and kinetics of fermentation (Ørskov and McDonald, 1979). Moreover, the in vitro gas production method can be used to examine animal waste components that impact the environment and develop appropriate mitigations. Thus, this experiment was intended to evaluate the in vitro fermentation parameters of grass based diet supplemented with two different tree legume forages in ruminants. The experimental feedstuffs, grass [Mulato II (M)] and legume forages [Gliricidia (G) and Sesbaenia (S)] were collected from forage research farm, University of Veterinary Science, Yezin, Myanmar and the feed mixtures were formulated as M70%+G30%, M70%+S30% and M70%+G15%+S15%. All ground samples were analyzed for dry matter (DM), organic matter (OM) by the method described by AOAC (1990) and neutral detergent fibre (NDF) and acid detergent fibre (ADF) by Goering and Van Soest (1970). Nitrogen contents were analyzed by using Kjeldahl method (Foss 2020 digester and Foss 2100 Kjeltec distillation unit) and crude protein (CP) is calculated as 6.25×N (AOAC, 1990). Y = Gas production at time t.
The data were subjected to the analysis of variance (ANOVA) and the significance of differences between treatments means were compared by Duncan’s Multiple Range Test (DMRT) using SPSS (version 16.0) software. Chemical compositions of experimental feedstuffs and feed mixtures are shown in Table 1. The DM and OM contents of all experimental feedstuffs were not significantly (p>0.05) different. The lower (p<0.05) CP and higher (p<0.05) fibre (NDF and ADF) contents were observed in Mulato II compared with legume forages, in which Gliricidia possessed the higher (p<0.05) NDF content than Sesbaenia. 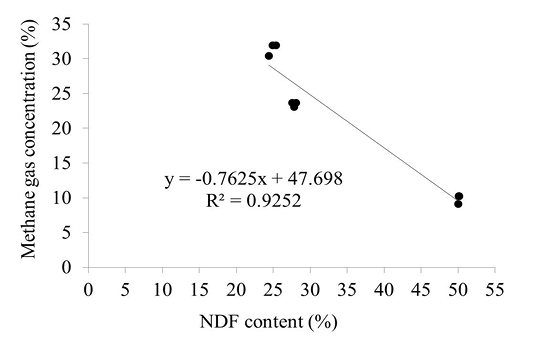 All chemical compositions except NDF content were not significantly different (p>0.05) among the feed mixture, whereas M70+G30 had the highest (p<0.05) NDF content, and then followed by M70+G15+S15 and M70+S30, respectively. The cumulative gas productions and effective net gas volumes of experimental feedstuffs and feed mixtures were shown in Table 2. The significant differences (p<0.05) in cumulative gas productions were observed in early incubation times (1, 6 and 12 h), whereas the later incubations were not different (p>0.05) each other. The gas productions of Gliricidia and Mulato II were significantly higher (p<0.05) than that of Seabaenia at 1 h incubation time. At the 6 and 12 h incubation time, Gliricidia gave the highest (p<0.05) gas production in comparison with Mulato II and Seabaenia, which were not significantly different (p<0.05) from each other. As the cumulative gas productions of feed mixtures, no significant differences (p>0.05) were found at all incubation times. The effective net gas of feedstuffs and feed mixtures were also not statistically different (p>0.05). The fermentation kinetics of experimental feedstuffs and feed mixtures are presented in Table 3. The gas production from quickly soluble fraction (a) of Sesbaenia was significantly lower (p<0.05) than that of Mulato II and Gliricidia, which were not different (p>0.05) from each other. The gas productions from insoluble fraction (b) of Mulato II and Sesbaenia were higher (p<0.05) than that of Gliricidia. The gas production rate constant for the insoluble fraction (c) of Gliricidia was significantly higher (p<0.05) than that of Mulato II, whereas that of Sesbaenia was not different (p>0.05) with other two feedstuffs. The potential gas production (a+b) was not significantly different (p>0.05) among experimental feedstuffs. For the fermentation kinetics of experimental feed mixtures, the significant differences (p>0.05) were not observed in this experiment. The nutritive values of experimental feedstuffs and feed mixtures are presented in Table 4. The highest (p<0.05) ME and OMD values were observed in Sesbaenia, followed by Mulato II and Gliricidia. The SCFA of Gliricidia was significantly lower (p<0.05) than that of Mulato II and Seabaenia, which were not statistically different (p>0.05) from each other. The TDN and DDM values of legume forages (Gliricidia and Sesbaenia) were significantly higher (p<0.05) than that of grasses, Mulato II. As the estimation of DMI, the highest (p<0.05) value was observed in Sesbaenia, and then followed by Gliricidia and Mulato II. No significant (p>0.05) variation on nutritive values except DMI were observed for the feed mixtures, whereas the DMI of M70+S30 was significantly higher (p<0.05) than that of M70+G30 and M70+G15+S15, which were not significantly different (p>0.05). All chemical compositions except DM are dry matter basis. a, b, cDifferent superscripts in the same column are significantly different at P value 0.05.
a, bDifferent superscripts in the same column are significantly different at P value 0.05.
a: gas production (ml) from rapidly fermentable fraction, b: gas production (ml) from slowly fermentable fraction, c: constant rate of fermentation, a + b: potential gas production, SEM: Standard error mean. ectively. The highest (p<0.05) methane concentration was observed in Sesbaenia, followed by Gliricidia and Mulato II. For the feed mixtures, M70+G15+S15 showed higher (p<0.05) methane gas concentration than M70+G30 and M70+S30, which were not significantly different (p>0.05).The relationship between NDF content and methane gas concentration of feedstuffs are displayed in Figure 2, in which the negative correlation was observed with R2 value of 0.9252. The lower CP and higher fibre (NDF and ADF) found in grass (Mulato II) compared to legumes (Gliricidia and Sesbaenia) are due to the difference of forage types (grass vs legume) (Schut et al., 2010). In addition, the higher CP content in legume is the outcome of its nitrogen fixation activity, a process by which nitrogen in the Earth’s atmosphere is converted into ammonia (NH3) or other molecules available to living organisms (Postgate, 1998). The fibre contents of grass species were higher than that of legume species because of higher proportion of stems in grass rather than legume forage, which consistent with the reports of Amiri and Shariff (2012). 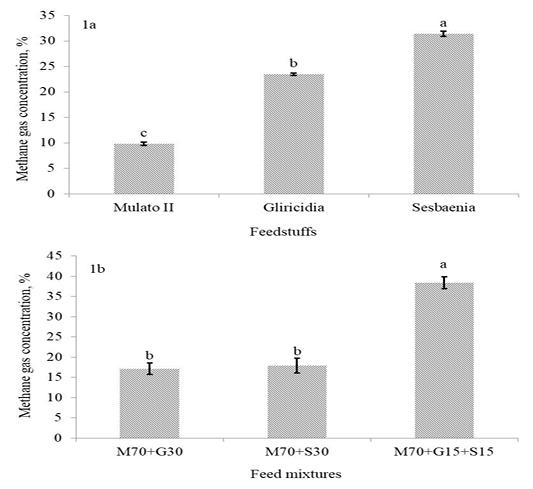 The difference of NDF content in feed mixtures was due to different inclusion level of feedstuffs, especially Gliricidia, which possessed the highest NDF content among the experimental feedstuffs. The higher cumulative gas productions of Gliricidia observed in early incubation times are due to different fibre contents and carbohydrate fractions. Gliricidia possessed lower fibre (NDF and ADF) contents, which are negatively related with gas production (De Boever et al., 2005) and fermentation parameters (Heidary and Kafilzadhe, 2012). The gas production of feed in buffered rumen fluid is associated with feed fermentation and carbohydrate fraction (Sallam et al., 2008). The low content of fibre can facilitate the utilization of feed by ruminal microbes, which in turn might induce higher fermentation rates (van Soest, 1994). Moreover, Blümmel and Becker (1997) also reported that the gas production is a mirror of degradable carbohydrate and therefore, the amount depends on the nature of carbohydrate. However, this assumption did notsupport to Sesbaenia, which also possessed the lower fibre content. The higher gas productions from quickly fermentable fraction “a”, lower gas production from slow fermentable fraction “b” and rapid constant rate of fermentation “c” were observed in Gliricidia, resulted in the higher cumulative gas production in early incubation time. Deaville and Given (2001) reported that kinetics of gas production could be affected by carbohydrate fraction. Gliricidia had low level of fibre contents, indicating higher level of soluble carbohydrate, which gave the higher gas production from “a” fraction and lower gas production from “b” fraction. However, this concept is not support to Sesbaenia, which also possessed lower fibre content. 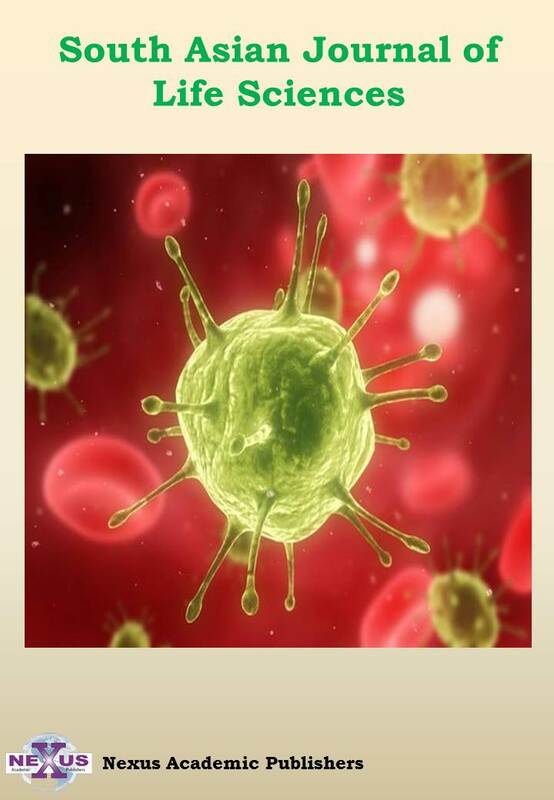 The rapid constant rate of fermentation “c” was observed in Gliricidia. The higher rate of fermentation was influenced by higher CP and lower fibre (NDF, ADF and ADL) contents (Osuga et al., 2006) and by carbohydrate fractions, readily available to the microbial population (Afshar et al., 2011). As the mention above, fibre content of feedstuffs influenced its cumulative gas production and fermentation kinetics. However, no influences of NDF content of feed mixtures on those parameters were observed in this experiment. The nutritive values were generally high in Sesbaenia, resulted from its higher CP content and lower fibre content. The estimated ME (8.86-9.91) and SCFA (0.91-1.09) values in this study were higher than the values (6.45-7.24) and (0.55-0.74), respectively, obtained from conventional feedstuffs such as natural grass, lablab bean residue, butter bean residue, sesame residue and sorghum stover available in Cental Dry Zone of Myanmar (Min Aung et al., 2015). The ME values of feed estimated from in vitro gas production was positively correlated with ME values of feed measured in in vivo experiment (Menke and Steingass, 1988). Thus, the in vitro gas production method has been widely used to evaluate the energy value (Getachew et al., 1999, 2002) and SCFA (Blümmel et al., 1990) of several classes of feed. The higher nutritive values (TDN and DDM) of legume forage as compared to the grass in this experiment may be attributed to leaf form and structure (Pontes et al., 2007; Rawnsley et al., 2002). Grass components are long and flexible with a low specific gravity, which are simply too complex, while vascular components of legumes are short, thick and bold with a high bulk density. This explains the potential of legumes to be digested easily. Moreover, the low content of fibre can facilitate the utilization of feed by ruminal microbes, which in turn might induce higher fermentation rates, therefore improving digestibility (van Soest, 1994). No variation on nutritive values of feed mixtures except DMI was observed in this experiment. Among experimental feedstuffs, the lowest NDF content was observed in Sesbaenia, which lead to the higher DMI for greater inclusion of Sesbaenia included in feed mixtures, M70+S30, M70+G15+S15 and M70+G30. Although the nutritive values varied among experimental feedstuffs and feed mixtures, all feedstuffs and feed mixtures possessed the nutritive values of high quality forages and complete feeds recommended by NRC (2001). The methane gas concentrations of feedstuffs were different from each other, in which Sesbaenia showed the highest value and then followed by Gliricidia and Mulato II. Moreover, Santoso and Hariadi (2009) also reported that the methane production was influenced by NDF content of the feedstuffs. Min Aung et al. (2013) also stated that methane production was positively related with fibre (NDF and ADF). Inversely, the negative correlation (R2=0.9252) between methane gas concentration and NDF content of feedstuffs were observed in this experiment. The reason for this finding is not clear currently. Thus, it needs to clarify the relationship between methane gas concentration and types of fibre. The methane gas concentrations of M70+G30 and M70+S30 were lower up to 45% than M70+G15+S15. Although Sesbaenia possessed the highest methane gas concentration among the experimental feedstuffs, the feed mixture included higher level of Sesbaenia gave the lower methane gas concentration. This might be due to the nutritional interaction between feed ingredients. However, the influence of nutritional interaction on methane gas concentration was not clear in this experiment. Thus, it is required to clarify the interaction between grass and legume forage. All feed mixtures (M70+G30, M70+S30 and M70+G15+S15) possessed the higher nutritive values (CP, ME, TDN), digestibility (OMD, DDM) and dry matter intake (DMI).Thus, grass and legume forage mixtures could be used as complete feed for ruminant without using concentrates. In consideration with environmental issue, M70+G15+S15 feed mixture should not be used as ruminant feed because of its higher concentration of methane. However it is still needed to conduct the further researches such as animal trials for the confirmation of these findings. 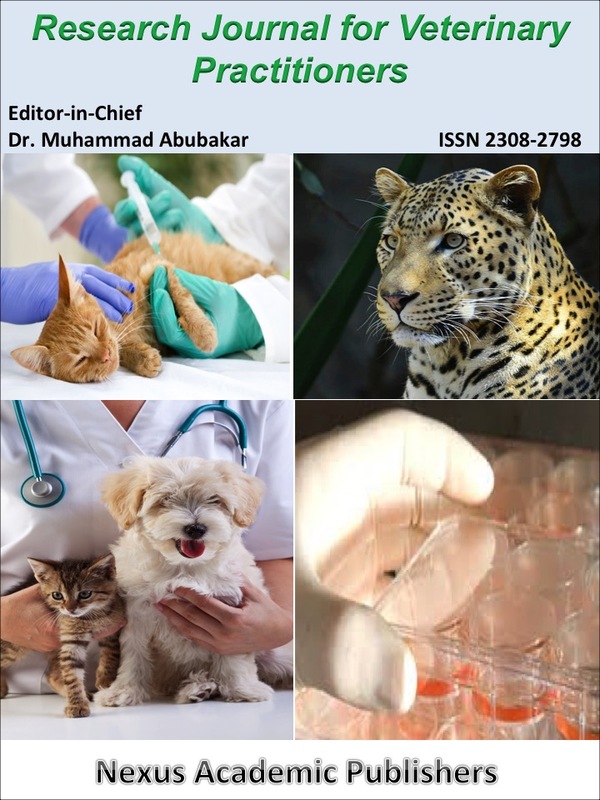 The authors would like to thanks the staff from the laboratory of Animal Nutrition, and Physiology and Biochemistry for their assistance in chemical analysis and animal care. MA, SMT, NCP, THP, YPP, NYP, LVB, ABB, HM, AMM, SYM, PPPM, DSL, KSDM, YYK and KSM designed this experiment and, MA, SMT, NCP, THP, YPP, NYP, LVB, ABB, HM, AMM, SYM and PPPM mainly carried out sample collection and analyzed the chemical compositions.MA, SMT and KSM performed data analysis and interpretation. SMT, DSL, KSDM and YYK drafted the manuscript and MA, YYK and KSM completed the critical revision of the article. All authors read and approved the final version of manuscript. •	Afshar MA, Naser NS, Hormoz M, Razeghi ME, Shayegh J, Abolfazl AG (2011). Evaluation nutritional value of apple pomance for ruminants using in vitro gas production technique. Ann. Boil. Res. 2:100-106. •	Amiri F, Shariff ARM (2012). Comparison of nutritive values of grasses and legume species using forage quality index. Songklanakarin J. Sci. Technol. 34(5): 577-586. •	AOAC (1990). Official Methods of Analysis of the Association of Official Analytical Chemists, 15th ed. Washinton DC. pp. 69-88. •	Blümmel M, Ørskov ER, Becker K, Soller H (1990). des Hohenheimer Gastestszur Schatzung Kinetischer Parameter der Pansenfermentation. J. Anim. Physio. Anim. Nutr. 64:56-57. •	Devendra C (1992). Nutritional potential of fodder trees and shrubs as protein sources in ruminant nutrition. In: Legume Trees and Other Fodder Trees as Protein Sources for Livestock, FAO, Animal Production and Health Paper. Pp. 95-144. 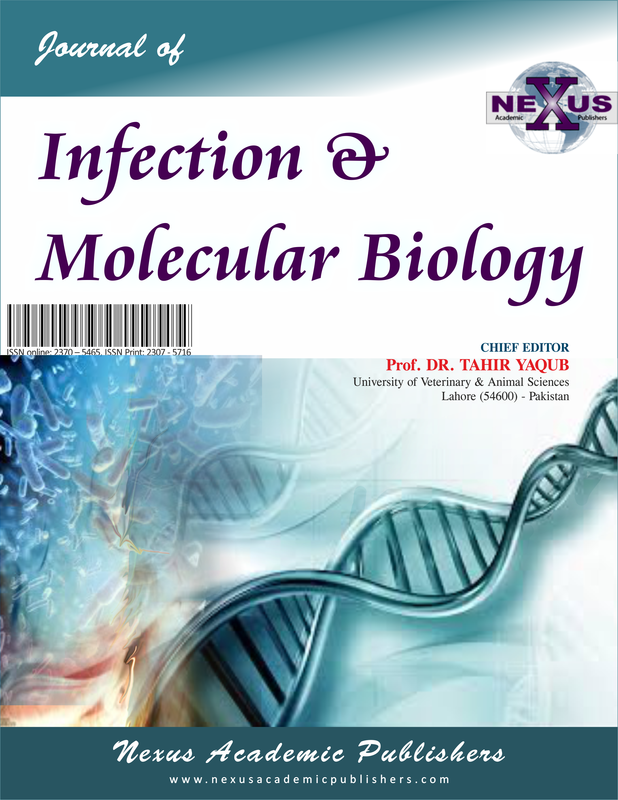 •	Getachew G, Makkar HPS, Becker K (1999) Stoichiometric relationship between short chain fatty acids andin vitro gas production in presence and polythyleneglycol for tannin containing browses. EAAP satellite symposium. •	Goering KH, van Soest PJ (1970). Forage fibre Analysis, Agricultural Hand book. 379. USDA, Washinton D.C. Pp:8-12. •	Heidary N, Kafilzadeh F (2012). Determining of chemical composition, in vitro digestibility and kinetics of fermentation of whole crop forage from 18 different varieties of oat. Iranian J. Anim. Sci. Res. 22:91-106. •	Lwin Naing Oo (2002). Effect of feeding tree forages as partial replacement of concentrates in rice straw based diet of goats on voluntary Intake, digestibility and nitrogen balance. M.V.Sc Thesis. University of Veterinary Science, Myanmar. •	Menke KH, Steingass H (1988). Estimation of the energetic feed value obtained from chemical analysis and in vitro gas production using rumen fluid. Anim. Res. Dev. 28:7-55. •	Min Aung, Tin Ngwe, Aung Aung, KhinHninSwe, Moe ThidarHtun, Lwin Naing Oo, Mar Mar Kyi (2013). In vitro gas production and its prediction on dry matter and organic matter digestibility and methane production of Albiziasaman pods partially replaced in commercial concentrates. Myanmar Vet. J. 15:69-77. •	Min Aung, Yin YinKyawt, MyoKhaing, Khin San Mu, Moe ThidarHtun, Lwin NaingOo, Aung Aung (2015). Nutritional evaluation of conventional feedstuffs for ruminants using in vitro gas production technique. Global J. Anim. Sci. Res. 3(2):518-523. •	Nang Khan Hline, Khin San Mu, Moe ThidaHtun, Lwin Naing Oo, Soe Min Thein, DezinSoe Lwin, JueJue, Jenny Hanks, Ganda Nakamanee, Werner Steur, Aung Aung (2015). Selection of suitable varieties of grasses for Myanmar. 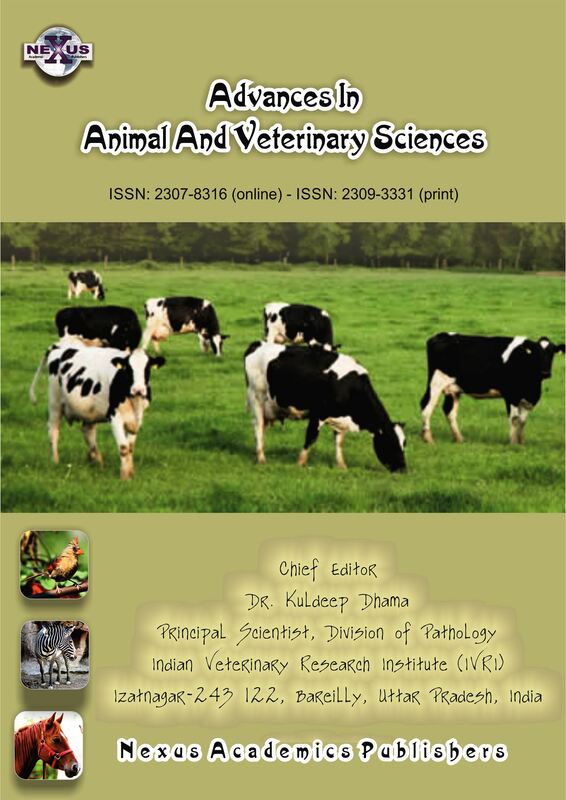 In: Proceedings of 23rd International Grassland Congress, New Delhi, India, 20-24 November 2015. pp. 989. •	Norton BW (1994). The nutritive value of tree legumes. In: Forage Tree Legumes in Tropical Agriculture. (Eds.Gutteridge RC and Shelton Wallingford HM). Tree forages in ruminant nutrition. FAO Animal production and health paper. Pp. 177-191. •	NRC (2001). National Research Council. Nutrient requirement of dairy cattle. 7th Rev. Edn. Natl. Acad. Sci., Washington, DC. •	Osuga IM, Abdulrazaq SA, Ichinohe T, Fujihara T (2006). Rumen degradation and in vitro gas production parameters in some browse forages, grasses and maize stover from Kenya. J. Food Agri. Environ. 4:60-64. •	Postgate J (1998). Nitrogen Fixation (3rd ed.). Cambridge: Cambridge University Press. •	Sallam SMA, Bueno ICS, Godoy PB, Nozella EF, Vitti DM, Al-Abdalla SS (2008). Nutritive value in the value assessment of the artichoke (Cynarascolyms) by products as an alternative feed resource for ruminant. Trop. Subtrop. Agroeco. 8:181-189. •	Thin Yadanar Soe (2017). Comparison on the digestibility of introduced grasses, napier grass and sorghum through in vitro and in situ methods. 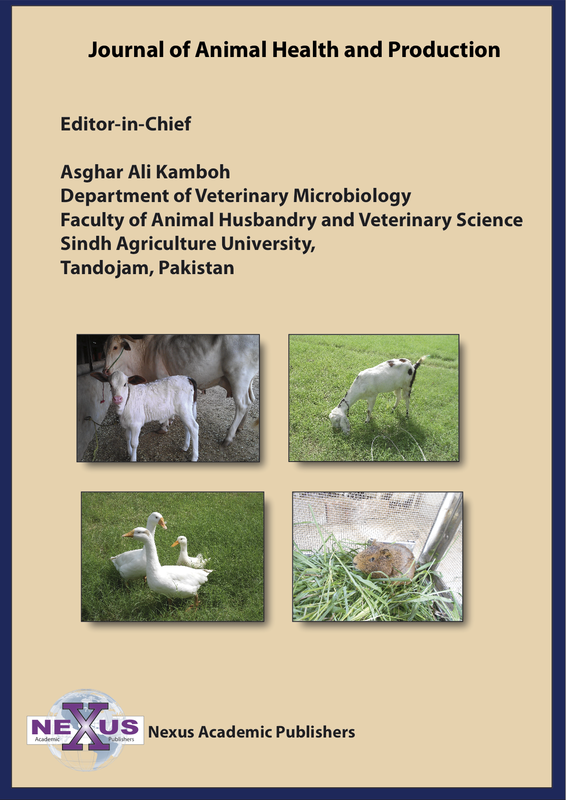 M.V.Sc Thesis submitted to University of Veterinary Science, Yezin, Myanmar. •	van Soest PJ (1994). Fibre and physicochemical properties of feeds. In: Nutritional ecology of the ruminant. 2nd ed. (Ed. Thomas LP). Cornell University Press, Ithaca, New York, USA.